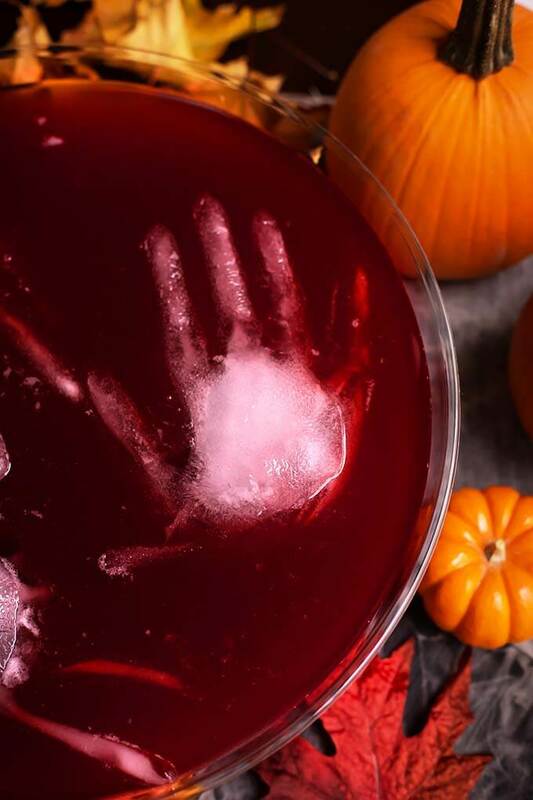 Spooky Halloween Party Punch is a fun drink to serve your guests at your Halloween Party. Scary ice sculptures make a chilling addition to this bloody delicious beverage. Ooooooh, it’s that time of year when the ghouls all want to come out to play! They’ll be howling and moaning, rattling chains and being all spooky. All that haunting must make them thirsty! I’ve got just the thing to quench the soul deep thirst of the undead. 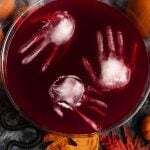 My Spooky Halloween Party Punch is an age old recipe for a simple brew that is tasty and pretty scary looking. Back in the olden times of the 1990’s, when I was raising a very frightening young Imp, we made lots of devilish delights for the Halloween parties we had at our castle. 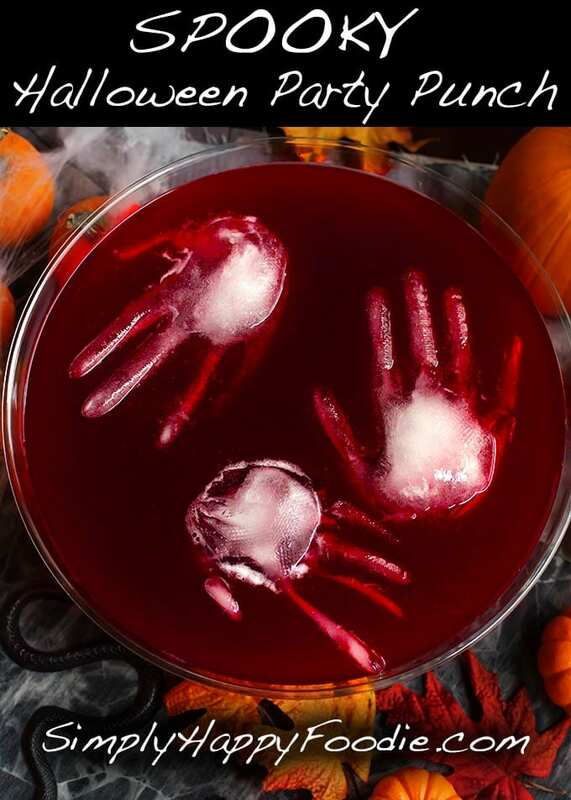 Some of the freakish and funny food features were the Jello Brain, Spaghetti and Eyeballs, and Witch’s Fingers. 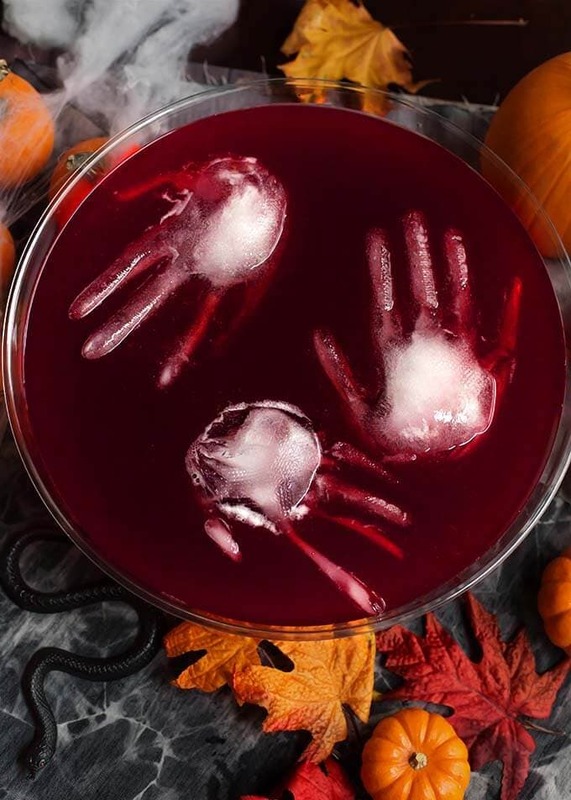 Our liquid refreshment was the Spooky Halloween Party Punch, with creepy ice hands pressing their palms against the surface of the blood red liquid. Desperate to get free of their bodiless existence. Oooooooooh! This frightening fluid can be concocted in mere minutes once your frozen phalanges are ready to be trapped in their punchy prison. If your guests are of age and will be imbibing, add some fire water to the potion in the form of vodka. For a fearful family friendly version, leave out the strong stuff and it will be as delicious as candied bat wings! Need to save some time? Make the punch ahead of time, leaving out the soda, and keep it in the ice box. Just add in the soda right before the monsters all show up to party like it’s 1699. When you fill a large punchbowl, make sure it is sitting where you want it first so you don't have to try and move it after it is full! Pour the cranberry juice, pineapple juice, and ginger ale, and vodka, if using, into a punchbowl and stir. Make sure you leave enough room for your spooky ice sculptures! For the hands, fill the food safe glove 3/4 full with water (or use juice so you don't water down your punch). Tie them like a balloon, or twist the end and use a strong clamp to keep it closed and lay as flat as possible in the freezer (possibly on a tray). When frozen solid, take them out of the freezer and very gently cut the gloves off using small scissors or knife. Be careful not to break the fingers! Add them to the punch just before your guests arrive. Those icy hands are such a fun idea! The punch looks like one we will like.